My friend asked me to street tune his G37 Coupe. We put the car to the test tonight at the strip and beat SharpByCoop's previous record.. Just barely! I think there's still more in her, but we only got 3 passes tonight. Hopefully next time we'll get even better times! Last edited by ttv36; 03-15-2019 at 02:18 PM. Congrats! Finally someone broke the record. Good to see some coupe racing action on here. It's been dead for quite some time. Are you able to share the power numbers? Always fun seeing what these cars are capable of. That was fun to watch. Great way to start my Sunday morning. I tuned this car on the street, we wanted to get a measurement of where this tune stands. The next plan of attack is to dyno tune the vehicle. Congrats. You kids stop making all that racket with your hot rods so I can sleep. Lol. Was this last Friday night? ^ Yessir, he really wants to turn up the boost and go back this Friday with 50s coming up. But I'm advising him we should go to the dyno. I mean he already has a record in 2018, he just needs to demolish it in 2019. I dispute your claim of "fastest". I'll definitely buy "quickest", though. must share this video and specs on my thread. and you know EXACTLY what i'm going to call it lol. how is your new updated VQ build coming along TTv36? 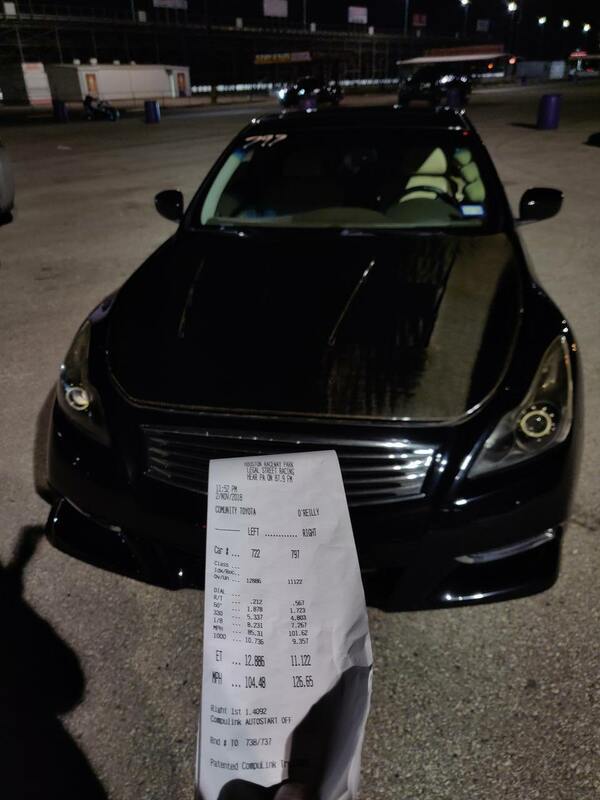 Joe dyno'd his car this past weekend at Houston Z Automotive and it made 576whp / 538wtq on their dyno. Any more videos of this? ?